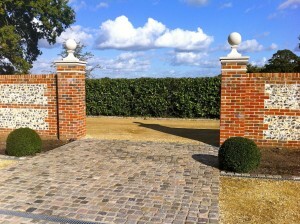 New Leaf Landscapes are experts in the undertaking of all Driveway and Entrance construction projects of the highest quality throughout Hampshire. We can call upon a combined thirty years experience in the building industry and offer a broad range of construction services which are listed below. 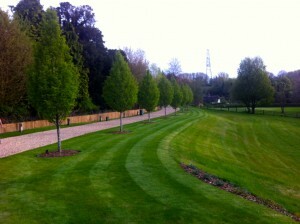 We can design, plan and build any form of driveway and Entrance construction. Our design team can produce 2D and 3D drawings and visuals along with full colour perspectives. From a set of Entrance piers to a full tree lined driveway for a country house we have the skills and expertise to deliver on each and every project. Our Driveways team specialise in working with all brick styles and sizes, brick bonds and mortar types. We also experienced in flint work and can incorporate this detail into any construction. 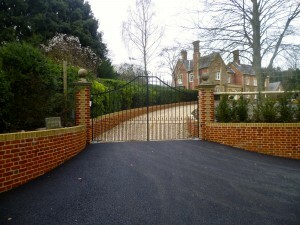 New Leaf Driveways have designed, produced and installed a wide range of bespoke hardwood and metal gates and railings. 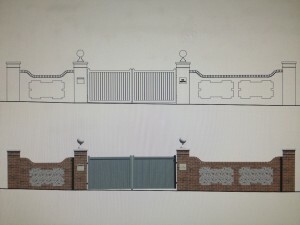 We Install full Gate Automation, secure entrance systems and lighting solutions for 24 / 7 peace of mind. 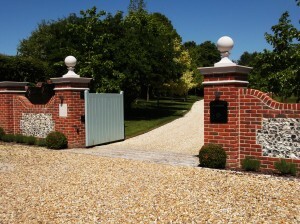 We have carried out a variety of design and build Driveway projects throughout Hampshire which are all included in our portfolios or for larger projects you can visit our previous sites for ideas, inspiration and your piece of mind. New Leaf have a commitment to customer satisfaction ensuring our clients return to use us for their construction and brickwork services time and again. We are more than happy to prepare quotations for any of the specialist brickwork services listed above, or any similar services.